Please renew your membership with the Coastal Alliance today! The Coastal Alliance needs your financial support as we work to protect the Wild Heart of Saugatuck. Thanks to your support, we have much to be grateful for this past year. Below is a brief overview of Coastal Alliance successes, accomplishments, and efforts. Thank you!We are honored, grateful, and humbled that the families of Tom Telder and Patty Birkholz suggested donations to the Coastal Alliance this past year. Tom was a strong supporter of Great Lakes protections. Patty was a mentor to all of us. It is Patty’s legacy we are working so hard to protect. We are fortunate to live in such a generous community. We are so often stunned by the kind words of encouragement, notes, emails, facebook posts, and offers of assistance. This year the Coastal Alliance is grateful to have had Mary Lukens and Dave Burdick, of Slant Communications, provide remarkable assistance in updating our website and helping with our ten-part series of ads. The Coastal Alliance announced a major fund-raising campaign in April with a goal of $150,000. Thanks to the hundreds of donations we have received through Go-Fund-Me, PayPal, and checks sent directly to our Post Office Box we have nearly achieved our goal. With your renewed membership we will hit our target. Thank you! • The Coastal Alliance was granted consulting party status along with the National Trust for Historic Preservation, the Michigan Historic Preservation Network, the Bily Family, Nottawaseppi Huron Band of Potawatomi, Match-E-Be-Nash-She-Wish Band of Pottawatomi, and Pokagon Band of Potawatomi. Consulting Parties are invited to review and comment on the NorthShore plans to ‘avoid, minimize, or mitigate’ damage to historical and cultural resources at the Kalamazoo River mouth. • On December 28th Michigan’s State Historic Preservation Office submitted a letter requesting the Army Corps consider alternatives to the proposed marina basin. This request is very significant. 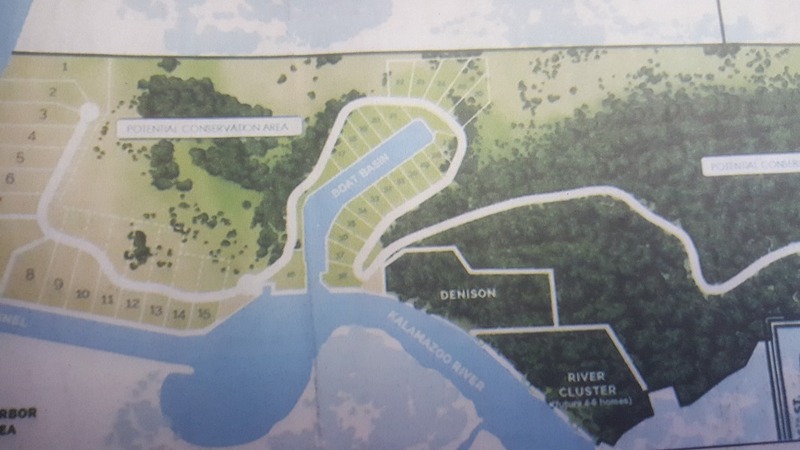 • The State Historic Preservation Office also requested more study be done on whether the Kalamazoo River Mouth Neighborhood meets the criteria for a ‘Traditional Cultural Property.’ There is long history of Potawatomi use, which continues today, of the Kalamazoo River mouth. The Coastal Alliance is optimistic the area will be designated a ‘Traditional Cultural Property.’ This too is very significant. • The State Historic Preservation Office concerns were echoed by four other consulting parties, all of whom request the Army Corps require NorthShore ‘avoid’ damage to the historical, cultural, and ecological resources. We will know the next steps in the Section 106 Review in mid-January. • The Coastal Alliance is a leading proponent of alternatives to the 1600’ long trench through the site of Singapore. We have hired Fresh Water Engineering to further explore and develop an alternative to the marina as currently drawn. We believe alternatives can be designed that fully protect the site of Singapore, the globally-imperiled interdunal wetlands, and the lake sturgeon. • The Coastal Alliance has hired a geohydrologist to prepare accurate modeling that will detail the impact of the proposed marina excavation to the ground water that feeds the globally-imperiled interdunal wetlands. Basic science and physics tell us the proposed marina will damage our water – by draining our wetlands and creating a stagnant stew near the river mouth. The Coastal Alliance is investing in doing the necessary analysis that will prove our concerns are based in good science. • The language in our local zoning ordinance is clear. The proposed marina is a violation of our local laws. 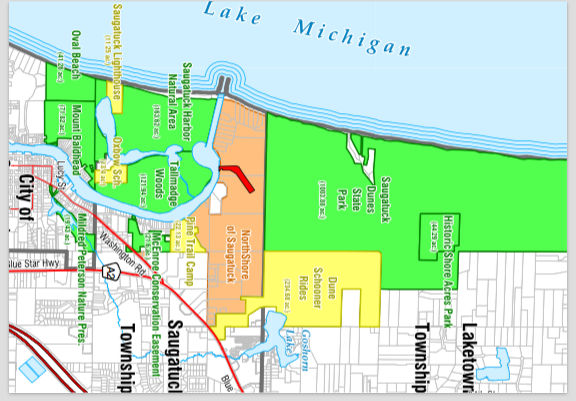 The Coastal Alliance long-time legal team from the Environmental Law & Policy Center and Olson/Bzdok/Howard have appealed to Michigan’s Appellate Court the Township Planning Commission’s decision which ignores local zoning. • To be clear: NorthShore of Saugatuck owns 1,447’ on the Kalamazoo River. NorthShore is proposing an additional 3,200’ of frontage for boats for a total of 4,647’. That is a tipping point. • In July, the Coastal Alliance was granted standing to challenge the DEQ approval of the proposed marina. This is significant as the Judge recognizes the proposed marina development could negatively impact Coastal Alliance members. The trial has not yet been scheduled though we anticipate a date in early fall 2019. 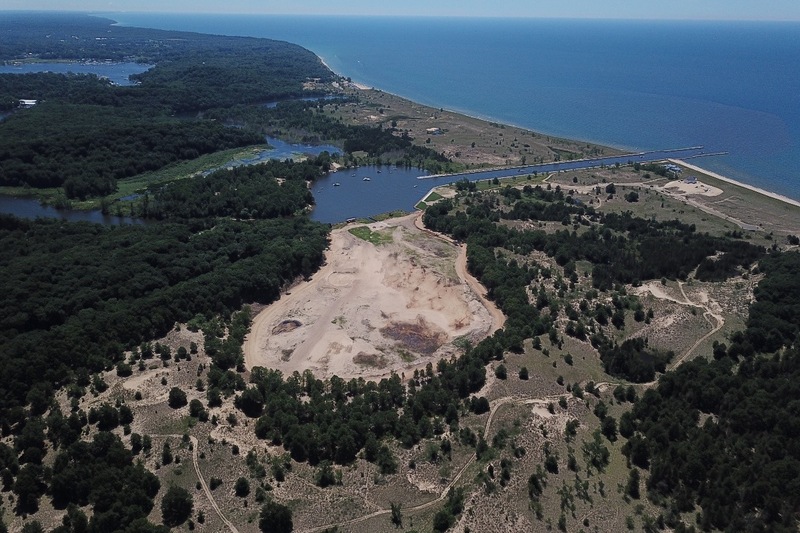 • The DNR continues to include the NorthShore of Saugatuck property in the proposed expansion plans detailed in the revised State Park Master Plan. This has been part of the State Park plan since the original plan was approved in 1982. We applaud the DNR for their perseverance in wanting to keep the Saugatuck Dunes an intact and healthy eco-system. • We have no paid staff. We have no office. The Coastal Alliance works out of our businesses, homes, cars, and local cafes. Your investment in the Coastal Alliance goes directly to our legal strategy – expert witnesses, scientists, cartographers, graphic designers, and the very best legal team in the Great Lakes region. Please make the Coastal Alliance part of your year-end giving, or your beginning-of-the-new-year giving. And please renew your membership – membership numbers are important. 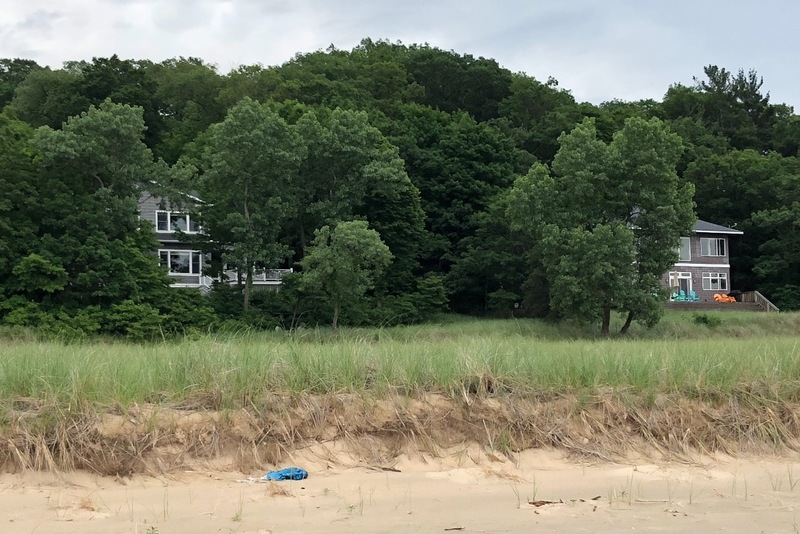 Together we can stop the proposed marina and protect the historical, cultural, and ecological resources in Saugatuck’s Historic Kalamazoo River Mouth Neighborhood. And yes, we are optimistic! ________________________________________________________________________________________________________________________________ Giving Tuesday is a terrific time for you to give to The Coastal Alliance. Your donations, added to many others, have allowed us to fight hard for the public interest at Saugatuck's Historic River Mouth Neighborhood. Back in September we were granted consulting party status in the Army Corps of Engineer Section 106 Historic Site Review. On Friday, 11/30/18, we will participate in negotiations to find a mitigation solution to the proposed damage of the historic site of Singapore by the proposed Padnos marina. For many, many reasons this marina is a bad idea, in a bad place, at a bad time. • Dunes and Historic River Mouth Neighborhood from in appropriate development. • Archeological remains of Singapore and native peoples. • Reestablishment of native sturgeon. • Endangered species including Pitcher's Thistle & Prairie Warbler. • Views from publicly-owned land. • Clean water & beaches. The photo above is 2018 photograph of Saugatuck's Historic Kalamazoo River Mouth Neighborhood. The big bald scar in the middle is where self-described "environmentally sensitive" developers are destroying dunes in expectation of being granted permission to dig a new river channel for a boat basin surrounded by expensive houses. There are few words, none polite, to describe this kind of destruction. This destruction is being perpetrated by the Holland-based NorthShore of Saugatuck development team of Jeff Padnos, Holland lawyer Carl Gabrielse, FifthThird Bank, Cottage Home, and Brian and Scott Bosgraaf. This destruction violates local zoning that clearly states: "In no event shall a canal or channel be excavated for the purpose of increasing the water frontage." This destruction is considered sand dune mining and was outlawed in 1998. This destruction is contrary to the Public Interest established in the Tri-Community Master Plan. If this Holland-based development team wants a place for big boats they should look at buying Tower Marine, or better yet putting it on the shores of Lake Macatawa where the Padnos family already owns land.GoFundMe is only a part of our fundraising - we are well on our way and confident in our ability to meet this goal. 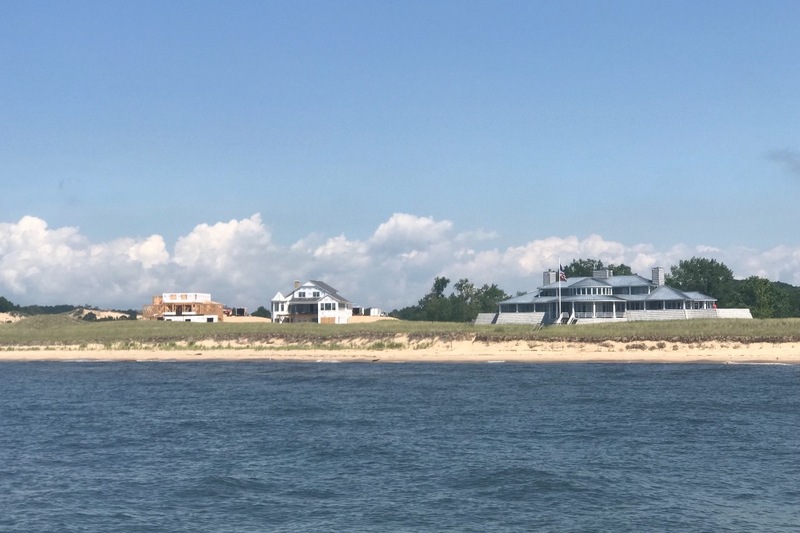 Based on what we were told, the houses would be "back in the trees," this recent photo, from the beach, is what we expected. And THIS recent photo, from the water, shows work in progress on the multi-million $$ homes being built. Matching Grant: We qualified for our exciting $30,000 in matching funds. We gained over 100 new or renewing members at the $100 or greater level. Some of those contributions were made via our website or via check to SDCA in US Postal Service. Ongoing fundraising: We will continue to need MORE donations to cover ongoing legal expenses. Please be generous and stay tuned for future matching grant opportunities. Thank you to everyone who submitted comments to The US Army Corps of Engineers! Anyone who lives in our community recognizes the importance of protecting the Historic River Mouth Neighborhood -- Singapore, Oxbow, the Saugatuck Lighthouse Cottage, and the many Pottawatomie sites. We will keep you apprised as to the outcome. 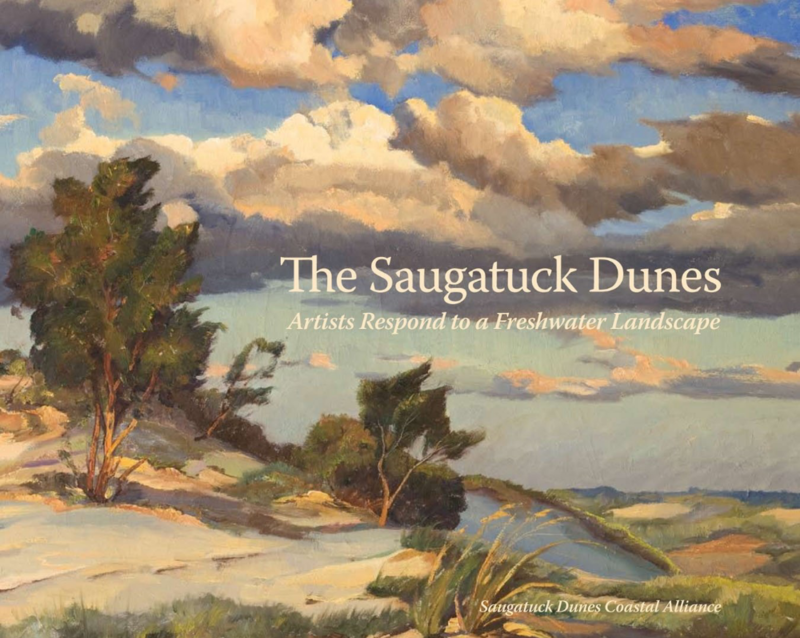 The Saugatuck Dunes in Saugatuck Michigan are being threatened again. Help us Save our Saugatuck Shoreline from a 50-yacht marina for 100'+ yachts. Together we can continue the fight to enforce local, state, and federal laws that protect our water, our sand, our beaches and other navigational, historical, ecological, cultural, recreational, educational resources– all at the undeveloped mouth of the Kalamazoo River. How big is the "Marina"? The 50-yacht private marina - really a huge trench - would be as big as 5.5 football fields, would be 18' deep, and would mean removing 241,750 cubic yards of sand - and putting it somewhere. what would this much sand look like? The The Coastal Alliance is a coalition of individuals and organizations working cooperatively to protect and preserve the natural geography, historical heritage, and rural character of the Saugatuck Dunes coastal region in the Kalamazoo River Watershed, beginning with the Saugatuck Dunes. The Coastal Alliance is represented by Olson/Bzdok/Howard of Traverse City and the Environmental Law & Policy Center. We work closely with a team of scientists, biologists, planners, conservation designers, historians, geohydrologists, marina consultants, GIS cartographers, and graphic designers. WE NEED YOUR HELP to stop the threats to the law, to the purity & safety of our sand & water, and to the safe navigation of boats in the Kalamazoo River and Lake Michigan river mouth. RECENT: Patty Birkholz passed away in May 2018. The Coastal Alliance sends its deepest sympathies to Patty’s family and the community at large. We are also humbled and grateful that the Alliance is one of the three organizations that her family has requested donations to in her honor. We hope you will consider this at either gofundme.com/save-our-saugatuck-shoreline or at saugatuckdunescoastalalliance.com. All of donations are being used to enforce the local and state laws aimed at protecting the Patricia Birkholz Natural Area from the impacts of the proposed marina development. Her legacy is so deep and inspiring. We are so much better for all she did and so bereft at losing her way too soon. To know Patty was to be filled with strength and love. We send our heartfelt wishes to our champion's family and to all of those that have been inspired by her life. Her obituary can be found at https://dykstrafuneralhome.com/obituaries/patty-birkholz.122023. Thank you - whatever you can give will help. We are honored, grateful, and humbled that the families of Tom Telder and Patty Birkholz suggested donations to the Coastal Alliance this past year. Tom was a strong supporter of Great Lakes protections. Patty was a mentor to all of us. It is Patty’s legacy we are working so hard to protect. Please see our updated story on the front page for more good news about our successes, efforts, and accomplishments. Giving Tuesday is a terrific time for you to give to The Coastal Alliance. Your donations, added to many others, have allowed us to fight hard for the public interest at Saugatuck's Historic River Mouth Neighborhood. Back in September we were granted consulting party status in the Army Corps of Engineer Section 106 Historic Site Review. On Friday, 11/30/18, we will participate in negotiations to find a mitigation solution to the proposed damage of the historic site of Singapore by the proposed Padnos marina. For many, many reasons this marina is a bad idea, in a bad place, at a bad time. Won't you make an additional donation to the Saugatuck Dunes Coastal Alliance today? Some welcome news going into the Labor Day weekend: The Coastal Alliance has been granted consulting party status in the Army Corps of Engineer Section 106 Historic Site Review. We will be allowed to participate in the negotiations to find a mitigation solution to the proposed damage of the historic site of Singapore by the proposed Padnos marina. 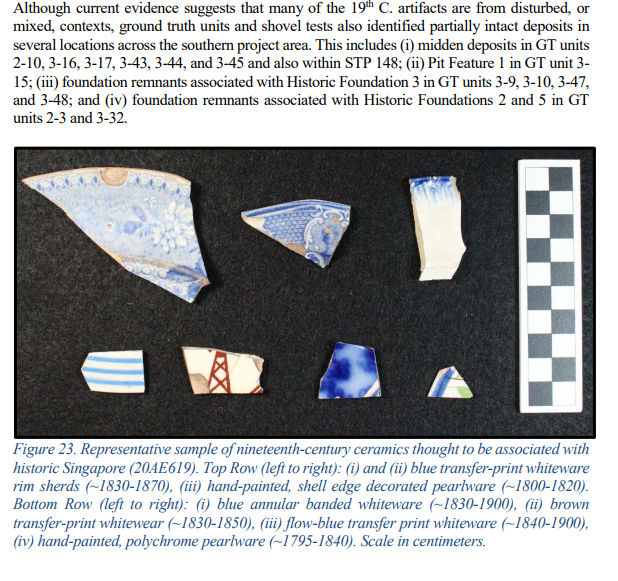 These artifacts were found during the archeological review - and one prehistoric flake of stone! Fundraising Success - By gaining over 100 new or renewing members since April at the $100 or greater level we met our matching grant challenge and will soon receive $30,000 to cover legal expenses as we continue to fight the Padnos Marina. Remember - It's Not A Done Deal. The proposed marina violates local zoning and state law and it is contrary to the public interests.